I tried to read the death date on this tombstone at Waverly Hall Cemetery in Harris County, Georgia, but was unable to do so. I checked to see if little Nannie's stone was listed in FindAGrave, hoping someone else had better luck. She is there, and the contributor has a guess, but is unsure. 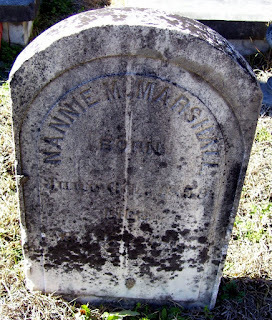 Here is my offer: Nannie M. Marshall was born 6 June 1859 and died 27 May 1868. Nannie's tombstone is obviously eroding, and I wanted to get her information out. You never know to whose family tree she belongs. Bright watch where heaven's own golden portals shine. Thank you for posting as this cemetery has many of my ancestors buried there! You are quite welcome, Lori!